2018 has been a historic year for us for countless reasons. Every single day was a door to a plethora of new opportunities to evolve in our own way and serve our clients with impeccable, ingenious, thought-provoking, and business-oriented mobility solutions. 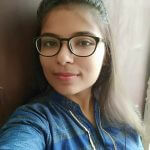 Throughout the year, we ventured into new opportunities, introduced new technologies and frameworks to our tech stack, refined our processes, worked with awesome partners, received accolades from clients, industry awards, presses, and B2B research portals, celebrated many small and grand events, participated in several reputed meetups and conferences. And all the while our Appinventiv family and portfolio of projects grew by leaps and bounds. Everything went just better than ever – making us more excited about exploring new opportunities, accomplishing new goals and build more moments together in 2019. The very first significant thing that happened in 2018 – one where we felt like ‘the-earth-may-stop-swinging-on-its-axis’ – was bidding farewell to our old office – the office where we got our first team, first project, first client, first award, and a lot of moments to cherish. We shifted to a new office building of 40,000 square feet (nearly 3 times bigger than previous office) with 10x higher goals, plans, excitement, and enthusiasm to face every challenge and build long lasting impressions. Though we embarked our journey with Blockchain in 2017, it’s in 2018 that we got the world talking about Blockchain app development services we offer. We helped businesses grasp the underlying architecture of the technology and delivered 18+ business-oriented Blockchain-based solutions making some of both – startup and Fortune 500 companies – decentralized. In 2018, we participated in a Google Progressive Web App Training event, and discovered, learned the trick of trades to unleash the convenience and transformative ability of PWAs. The ability which we then injected into 10+ clients and their customers across the world. Keeping up with the constant strive to emerge as a torchbearer, we learned and added Flutter to our tech stack. We disclosed the Real Google Strategy Behind Flutter, actively participated in Flutter open-source communities, and created apps that got our clients fame and revenue. This year, we raised a toast for our 3 years of togetherness, achievements, relationships, and supportive friendships. We revisited the last 3 years through the kaleidoscope of happy memories and vowed for new adventures ahead. 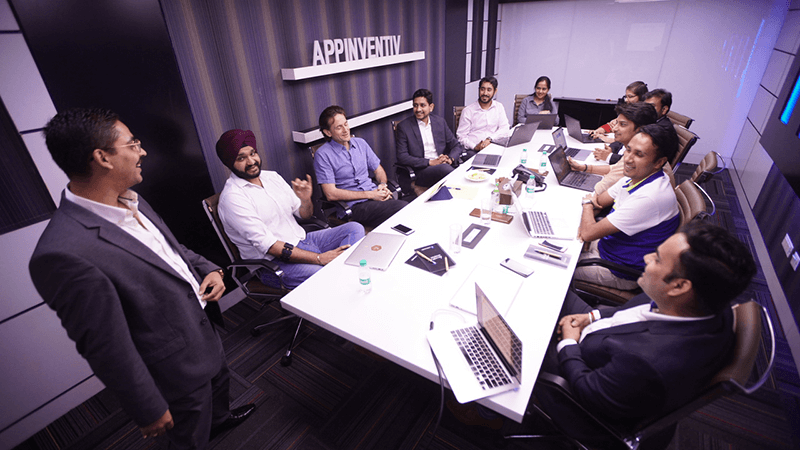 We got listed in Appfutura’s 2018 list of Top Mobile App Developers in New York, proving that our services and market presence are not just limited to India – the country where our headquarter is, but that we are also the top dog globally. 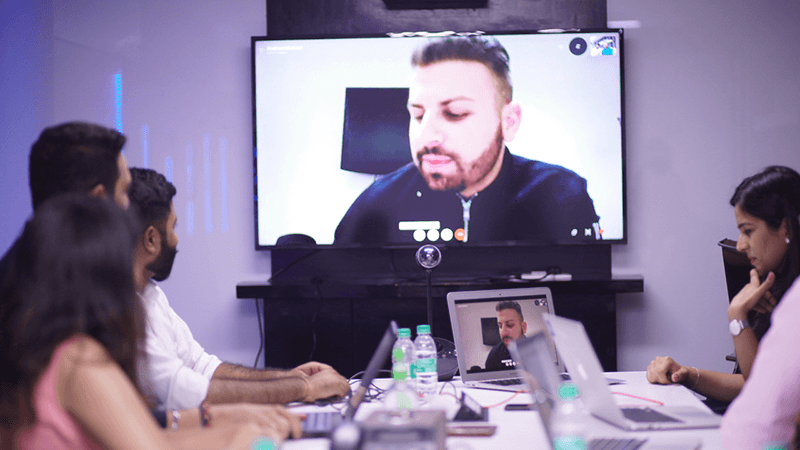 Another upbeat announcement that made 2018 special for us was that our Co-founder and CEO, Sudeep Srivastava was invited by The Manifest – a reputed B2B News and How-to Site, to share his views on the growing popularity of Google Maps and PayPal in the market. Our services not only contented the business owners and their user base, but also caught the attention of a popular media source of mobile app industry, MobileAppDaily. Our constant strive to perfection placed us at the top position in their list of Top 15 Android app development companies and Best Blockchain Development Companies 2018. After being picked for Google Design Sprint Workshop in 2017, we were invited at Google Developers Agency Program in 2018 to share our secret of rampant growth and client satisfaction – a validation of how True Leadership, Trust and Culture of Innovation is what it takes to grow a company. In 2018, our team explored untapped opportunities in the Enterprise ecosystem. We worked closely with various small and big enterprises and offered business-centric solutions to them. We cemented our expertise with the Blockchain-based omnichannel retailing platform made for NCR for their retailers to cater to the needs of the customers in varied forms in real time. In 2018, we took a turn from working for the interest of millions of humans to working for the interest of Mother Nature. We partnered with 10+ prominent companies and showed the world how e-Scooter apps can provide the best commuting services without compromising on the fuel and carbon emission. Holding the No. 1 position in AppFutura’s List of Top App Development Companies for two years in a row is yet another remarkable thing that happened to us in 2018 – something for which we give the credit to our Clients who trusted in us. 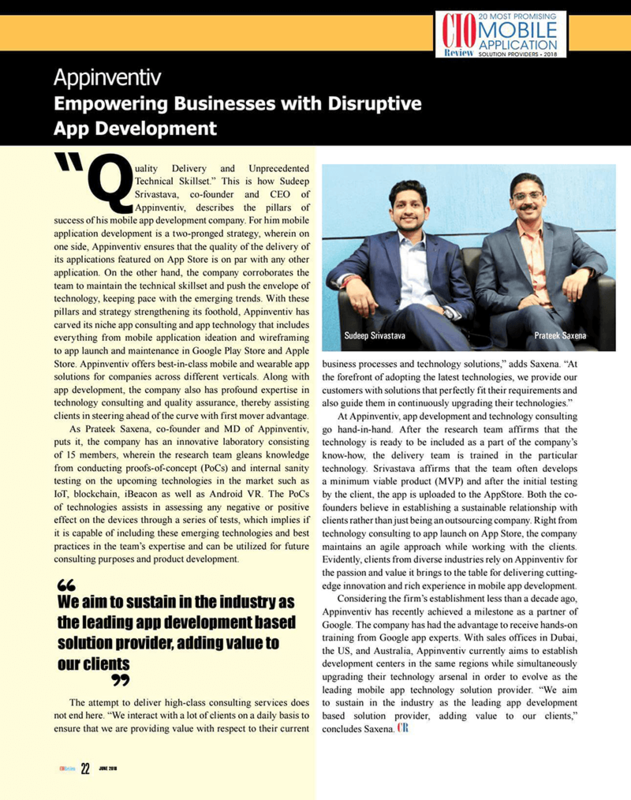 Appinventiv, by delivering unparalleled services to clients and their millions of customers, also bagged a position among the Top 12 Global leaders 2018 handpicked by Clutch by comparing more than 200 mobile application development companies around the world. 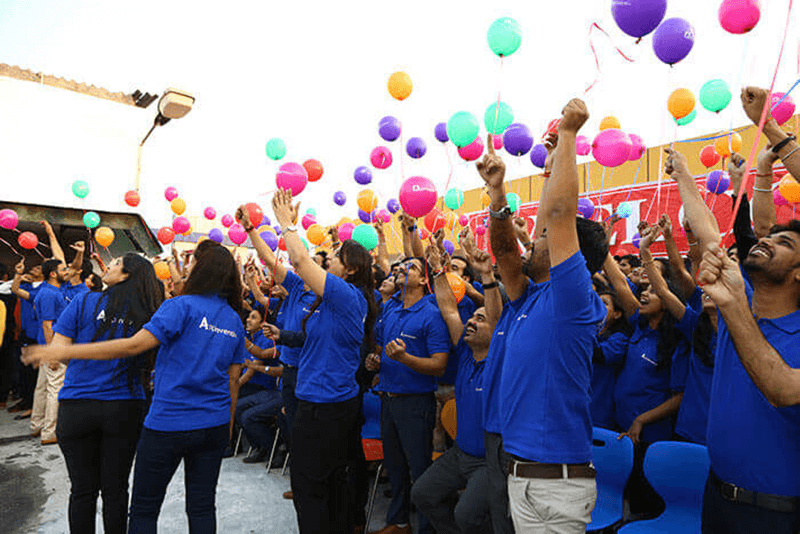 Back in 2017, we were around 220 experts under the roof of Appinventiv and fast-forward to today, we are just a few numbers less to hit 400 – credit of which goes to our HR management team, our work culture and of course, every member of Appinventiv who makes the company a second home – a place of trust and respect. 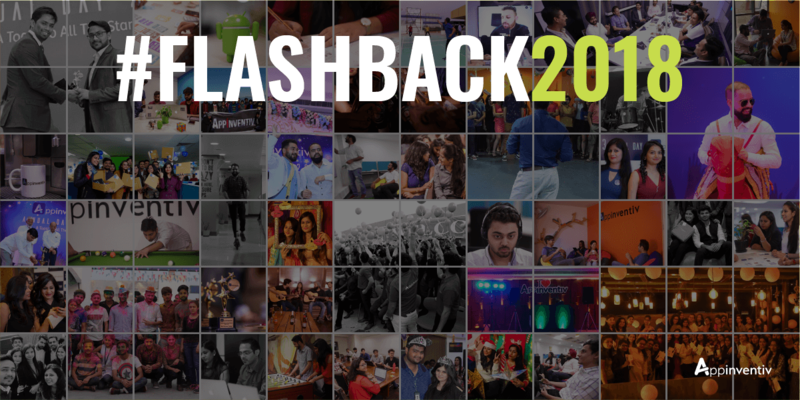 While these were some of the biggest highlights from our journey throughout the year 2018, we look forward to another phenomenal year. We hope for a time to experiment with new technologies and introduce more innovative solutions in the market. A time to develop stronger relationships, cherish more memories, and get even closer to our long-term goal of becoming the World’s Best Mobile App Development Company.